I GOT MY COINS! At this point, all I have to say is that BitQuik is a cryptocurrency exchange that has great integrity. Apparently, my holiday weekend messed things up. I decided to go up to visit family and I thought I could do everything, I put my bitcoin on hold and did my deposit approximately 6 minutes before my 3-hour window on Good Friday and sent my deposit picture 2 hours later, I did all this while I was on a extended holiday weekend which caused my phone number to be different which unfortunately raises an eyebrow at bit quick and I had to go through the whole verifying process again. I thought for sure they could double check me on file. Apparently they cant and caused a delay due to security concerns. I talked to my friend who's a financial guy and he explained to me that unfortunately, cryptocurrencies are unregulated he said that bit quick can do anything that they want, there are no rules, so what I want to say right now is a Bit Quick did nothing wrong. By the end of approx. 125 hours I had all my Bitcoin with no fees involved as stated on their website. So all I can say is just be patient if there's a hiccup with the transaction process once again my friend said that cryptocurrency exchanges are under the microscope for any type of possible corruption or mismanagement causing them to be overcautious yet Bit Quick came through with flying colors for me once again! Even thou I did everything wrong. Thank you Bit Quick! Note: If you're going to buy from Bit Quick put aside that three-hour window and devote all your energy to following the exact directions that they have on their website do not deviated from it thinking everything's going to be okay because if they have security concerns that they feel they have to address it causes delays, you lose time, they lose money, it's very counterproductive. John C.
It’s been approx 120 hours since I made deposit for bitcoin, uploaded the receipt done all verification's and still haven’t got my coins or any replies to the numerous followup emails I’ve sent. I'm still hopeful from what I've read here, yet very concerned. John C.
Like I said I finally got my bitcoin arrived after the long with with my 2% fee waived . Thanks once more . 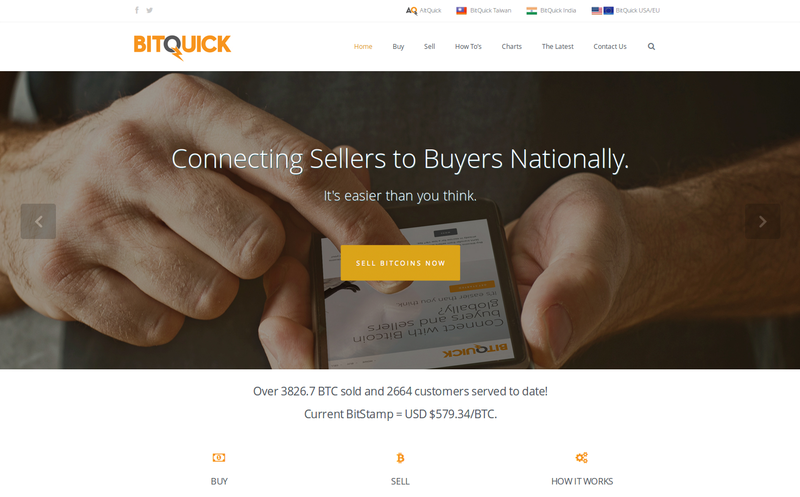 This was my first transaction with BitQuick and overall I was very pleased. I was slightly frustrated at first, apparently BitQuick was having some minor server issues right as I was about to make my first buy. Having never done this before I wasn't quite sure if my buy order was being processed or not (it wasn't.) Basically I was getting "Site error" message from reCaptcha, so I could not complete that and finish my order, and also I was periodically getting "unable to select database" errors when navigating the site. I was finally able to submit a help ticket using the contact form, (once reCaptcha was working again) and Chad responded to me promptly apologizing for the glitches and assuring me it was a temporary issue. I was able to complete the order process at about 12:25pm, went to Chase Bank and made a deposit, uploaded the receipt at 1:44pm, my bitcoins appeared in my wallet (unconfirmed) at 2:16pm, got my first confirmation at 2:25pm. One thing to note -- Chase Bank at first told me I could not make a cash deposit to another account that was not mine. I was aware this was a business account number I had been given, and told them so. Then the head teller came over and told me if it was a business account I could make a cash deposit but they would need to see my photo ID even though I was not a customer of the bank. I did give them my ID, and they typed my info into their computer as they processed the deposit. This doesn't particularly bother me, but I just thought I should make note of it in case anyone else would find it inconvenient. I don't know if this is simply Chase, or this branch, or this particular teller, but that was my experience. Again overall I was pleased with this transaction and will probably use BitQuick again. Sent proof of payment over 24 hours ago and have not received my coins Scamming thieves. Uploaded proof of payment 2 days ago and they never sent my coins or even replied. Used them for years. Beware and avoid at all costs! They defrauded me of over $3000 They finally sent my coins. I would not recommend using them again. I will not be. This is one of the most fastest and trusted platform to trade your bitcoins, it’s welcoming, it’s advisable and it’s safe. Been using them over 2 years Today took less than 10 mins from upload to transfer. Never had a problem after deposit. Twice info wrong for a credit union offer, but deposit was refused. Never left with money out. Always receive bitcoins in a timely manner. Fastest and easiest way to buy or use Bitcoin.